see life expectancy rise to 88.6 years (for males 65 years old) and 91.2 years (for females 65 years old). 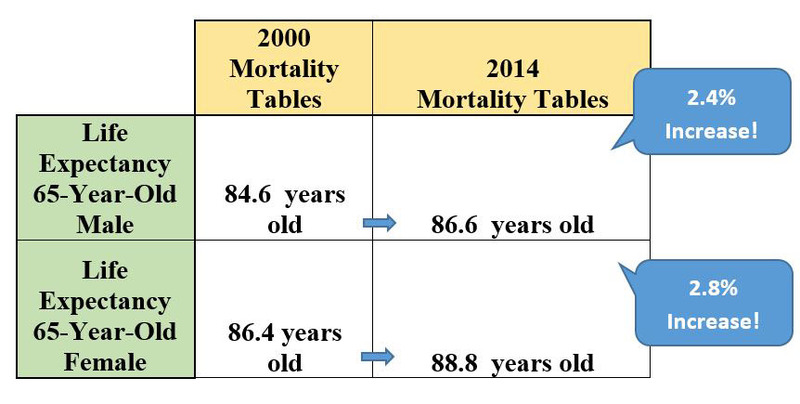 in life expectancy and should expect it to rise even greater than the trends indicate. 7 percent, and from 7 percent to 5 percent. These will not be small adjustments. annuities from other investment options. and return of principal. More importantly, only life insurance companies can manufacture mortality credits. now. These are likely the highest longevity credits you will see for the rest of your life. Here is another interesting fact: the life insurance industry has only a limited amount of longevity credits. See, it is the life insurance on the books that provides the built-in hedge to lifetime income annuity sales. the “longevity credit pool” begins to drain. This will also affect pricing of annuity products in the future. to a pond with a limited supply of fish?